Female from South Africa Namibia. Home » Female from South Africa Namibia. 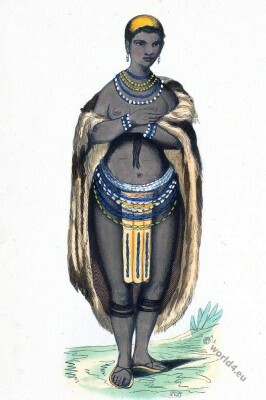 A female costume from South Africa, Namibia. Female from South Africa Namibia. Historical clothing. From the book: Mœurs, usages et costumes de tous les peuples du monde, d’après des documents and authentiques et les voyages des plus récents; Publié par Auguste Wahlen. Chevalier de Plusieurs Orders. Europe. Bruxelles, a la Librairie Historique-Artistique, Rue de Schaerbeek, 12. 1844. Costumes of all countries by Alexandre Lacauchie. This entry was posted in 19th Century, Africa, Namibia, South Africa and tagged Auguste Wahlen, South America on 6/4/15 by world4.